No, it doesn’t. It should have been done by a real arborist, from the outset. Ever notice that a well-pruned tree looks healthy and strong immediately after the pruning? Why don’t arborists need the “growing in period”? Maybe because they know what they are doing? There are a variety of reasons for tree pruning in Neerim. Pruning is necessary to remove storm damaged or diseased branches. Pruning can also attractively shape a tree to provide a more pleasing landscape. What many amateurs don’t fully understand or have not mastered is thinning a tree to promote new growth. This is a technique whereby individual branches are trimmed from the tree so that they don’t rob other branches or sprouts of nutrition. It is much like the meticulous pruning of rose bushes to help them grow full and strong. The process of thinning a tree correctly requires years of study and experience. Another advanced tree pruning technique is uplifting branches to reduce obstruction. This technique is also best left to a qualified professional rather than the occasional tree pruning homeowner. An additional advanced tree pruning technique is pruning a fruit tree to enhance crop production. 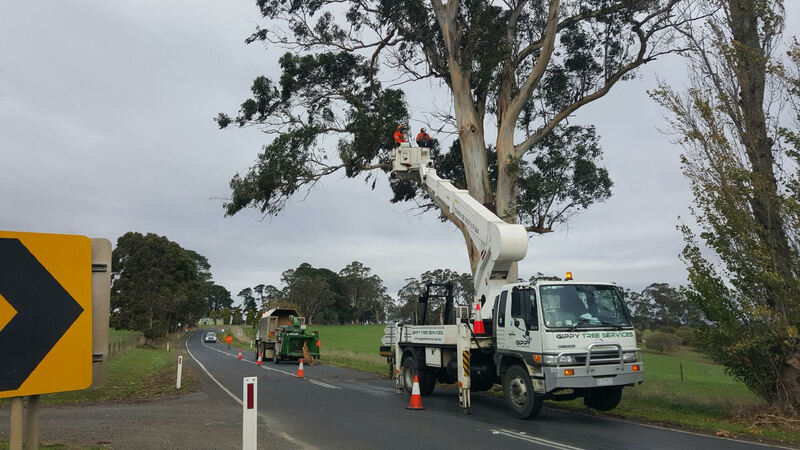 Discuss tree pruning in Neerim with a representative of Gippy Tree Service today. We are a locally owned family run business in the Neerim area.